Much like its above-ground counterparts, ground penetrating radar (GPR) directs high-frequency radio waves toward specific regions or targets and these waves are "bounced back" to a receiving unit that then interprets them. The obvious difference here is that GPRs are not used for detecting aerial objects but instead are employed to "see" what lies beneath the earth. The image at the beginning of this post is a great example of what I am talking about here. 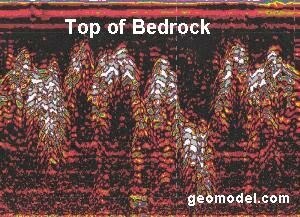 In it you can see the general underground bedrock configuration for a given survey area. Once again, an electronic view such as this can make a real difference in locating potential gold deposits , whether those are placer or lode in nature. GPRs come in all shapes and sizes, including portable models that can be carried or "packed in" by a solitary individual. Coincidentally, in recent years numerous treasure troves and caches have been recovered using GPRs, including some attributed to Jesse James and the Knights of the Golden Circle (KGC). A probe or loop is inserted underground and a high-frequency alternating current is used to create what is known as a "primary" EMF that, in turn, generates "secondary" EMFs. It is these secondary EMFs that are the most effective in locating conductive ore bodies, including gold. A receiving unit then records and "interprets" the data gained from these underground EMF scans. When EMF surveys are conducted properly, they can be very effective in locating gold-bearing veins , faults, and dykes in a range of environments. In a sense, conducting an EMF survey is a lot like swinging a modern gold metal detector , with the main difference being that with an EMF survey you can "sweep" or cover large expanses of ground at depth in one fell swoop, instead of being restricted to the ground beneath your feet or immediately around you. Like their conventional metal detector cousins, larger EMF arrays tend to lose sensitivity with depth (although EMF capabilities far exceed standard detectors in this regard). 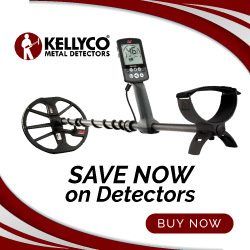 Unlike metal detectors however, EMF gear is not good at identifying very small pockets of precious metal. Conversely, EMF surveys excel at "seeing" where large ore bodies or masses of conductive metal lie underground. That's it on this topic. I wish you all the best of luck out there. If you liked this post, you may want to read: "More on Gold Prospecting: Modern Methods (Part 2)"